JON ANDERSON CAME OUT AND SAID HE HAD A TICKLE IN HIS THROAT AND THIS WAS THE BANDS TRUE WARM UP FOR THE TOUR. TIME AND WORD HAD JON THEN STEVE AND THEN CHRIS COME OUT SEPARATELY FOR PARTS OF THE SONG, A DIFFERENT APPROACH. MUD ISLAND WAS AN OPEN AIR VENUE AND IN THE DISTANCE THERE THUNDER AND LIGHTNING IN THE BACKGROUND WHICH ENHANCED THE SHOW. IT LIKE THE GREAT SPIRIT WAS ENJOYING THE SHOW TOO. THE LAST SONG WAS A HARDY ROUNDABOUT AS EVERYONE WHO LEFT CLAPPED THE NIGHT AWAY. THEN ON TO PEABODY FOR LATE NIGHT EYE OPENER AND BACK TO GERMANTOWN AND A BEER A MORE VINYL IN AN UPSCALE HOME. LONG WAY FROM PHILLY. HOWEVER, THE BAND DID NOT RETURN TO MEMPHIS FOR THE REUNION TOUR, HAD TO FLY HOME TO PHILLY TO SEE THE SHOW THERE. The other reviewers tend to overlook one thing about this concert, or perhaps they all had better seats than I. About 20 percent of those at the concert were young fans that expected 90215 and Big Generator songs and were very disappointed. After five or six songs, they got up and left leaving many empty seats. In 1989 or was it 1990 that ABWH toured we journeyed to Memphis to see the first concert in the tour. Staying at our cheap hotel I started calling the nice hotels in town to locate them. Figuring that ABW and H might be registered under aliases I asked for Tony Levin's room. Found them at the Radisson if memory serves me. Off to the Radisson! Couple hours before the concert as we set in the lobby, incidentally a beautiful white piano used in the Jerry Lee Lewis movie starring Dennis Quad is in there, down the glass elevator, descending into the centre of the earth,er I mean lobby, comes Rick Wakeman! He left the lobby and we followed. He was standing on the front and we asked for his autograph and made small talk. After about 10 minutes he was becoming concerned that his limo was not showing up. So, we offered him a ride. He asked about the concert being on Mudd Island if we could actually get him out on the island. Sadly we had to reply that we would have to park on the "mainland" and ride the tram over. He pondered this and decided against going with us. I seriously believe he was considering hitching a ride with us. Nice guy. This was an historic concert for myself and other fans, for the members of ABWH, and for the annals of Yes history. 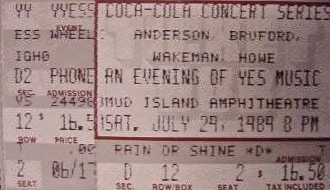 It was the first Yes concert I ever attended (can there be ANY debate that ABWH was indeed Yes?!). The same great circumstance applied for my friends as well. As luck would have it, we couldn't have chosen a better first live Yes show. But the special atmosphere and nature of this show was not reserved for the first-timers only. Many other true fans were there and in a state of euphoria. The parking lot for the island recreation area was filled with the cars of Yes fans, marked with Yes bumper stickers and license plates. Some fans had travelled from the East coast! And of course, the Yes shirts from previous tours, many with beautiful Roger Dean art, were abundant in the over-capacity crowd. Some serious die-hards had homemade t-shirts proclaiming captions with "Fist of Fire" or "Order of the Universe" 'illustrated' on them. 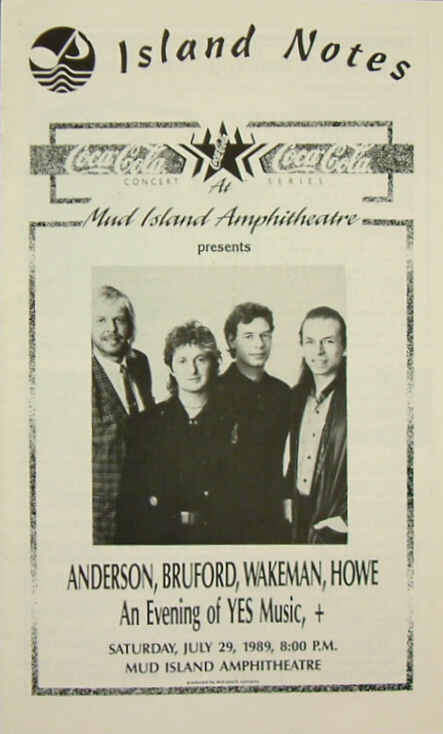 This would be Messrs.. Anderson, Bruford, Wakeman, and Howe's FIRST PUBLIC PERFORMANCE TOGETHER SINCE THE _FRAGILE_ DAYS. The significance of this event wasn't lost on the concert-goers. The show had been sold out for weeks. The crowd was filled with people of most age groups, and diversity. But practically all seemed to be knowledgeable Yes fans. Some people without tickets were in boats on the Mississippi off the island just so they could hear some of this concert. The small outdoor amphitheater (with beautiful views of the city and bridge over the Mississippi, and nice weather in the middle of the summer by the cool river) provided the perfect setting for this 3-hour debut show of the tour. We arrived early enough to check out the surprising Martyn Dean stage layout, gaze at the instruments set up, and pore over our just purchased programs. It all looked so cool. Now remember, being the first show of a tour by a group of musicians who hadn't performed together in say 16 or 17 years, we had little idea what to expect. So imagine the shock of having Jon Anderson enter the way he did, singing "Time and a Word"! Frankly, I didn't even recognize it at first. My best friend did and shushed us all into silence. My God, Jon's voice was so clear, high, angelic... DEAD ON. The solos continued in a blur. Steve Howe 'snuck in' some of THE ANCIENT on acoustic, and it was beyond words. Wakeman was on the other side of the stage, so we couldn't see his amazingly fast keyboard work... but we could hear it! The crowd roared their approval. "Long Distance Runaround" was a neat surprise. Highlights of the first set included "Birthright" (with a great mood and atmosphere) and "And You and I." AYAI was another crowd favorite and was heaven to finally hear live! I was very lucky to see ABWH on their first ever performance in Memphis, on July 29, 1989, and for what I can tell from the video, there's a few things they dropped from the set after that show. When I saw Steve's solo, Jon was on stage for the performance, and they actually did part of the acoustic bit from "The Ancient" ("Does the lamb cry out before we shoot it dead?"). It was very exciting for me, since it's the only time I've seen even part of _Tales_ (my favourite album). Also, they performed "Quartet" of the album. Both were really good. Anyway, does anyone know if this was the only show they played those songs for? Really is a pleasure to be here tonight. As you know this is our first...show together. Woo! So...you can expect anything to happen, and it maybe will you see. Woo! As, uh, is always the, uh, situation where we enjoy very much writing new songs and all that we can do is try very hard to perform them because that's how they get better and more...so that was a song from the new album and the title of the song is 'Quartet.' Its 4 songs that seem to run into each other and its a sorta mood that you create, now here's a song that I'm sure or I hope.......you know. See ya after a while! Woo! Thank you very much. Thank you very much. Woo! I think..uh.. just.. uh..during the recording of the album. Getting together again after so many years is just..uh..is quite unbelievable. We all seem to..we all seem to believe in the same things musically and many ways the way we live and everything. And..uh..I remember one day. This was in a beautiful, beautiful island in the Carribean were we did some recording and..uh..we had to drag Rick out of the..uh..swimming pool because he used to enjoy swimming around, it was very warm. [??] big swimming pool now. We dragged him out of the swimming pool and into the studio and we put together this song and it's called 'The Meeting' which is really..pretty much about what we did. We got lots more songs but..uh..time's a wasting. We at least are going to do one more for you, very special song.